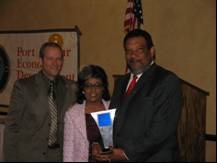 Since 1992, the Golden Triangle Minority Business Council has participated in the Annual U. S. Smalll Business Administration Small Business Person of the Year. 1993 - G.A.J. Investments & J. Allen Contractors & E.P.A. Transport. 1996 - Haynes Enterprise, Inc. & Global Home Health Services, Inc.
2002 - Golden Triangle Courier Services, Inc.
2004 - Hardy Contractors, Inc.
2007 - Barbara’s Bon Bon, Inc.
2009 - Filter Resources, Inc. & Threads, Inc.
2010 - Midwest Steel Company, Inc.
2011 - Kinghts Inn, Inc.